There are many different types of wasp in the UK. The one we all know is the common wasp (above), the ruin of many a barbecue in summer and autumn. I call this shot, “Mirror, mirror on the wall”. 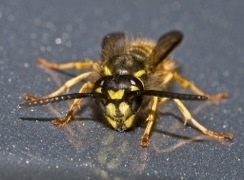 Common wasps are social wasps, living in colonies. 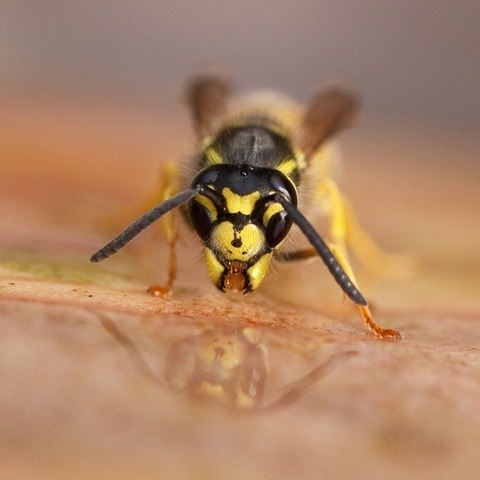 There are also many different types of solitary wasp, that dig burrows and, very often, have a parasitic life-cycle, such as the wasp in the next picture. Your eyes are not deceiving you; this wasp is indeed pulling the legs off a spider! It is a type of spider wasp of the family pompilidae. (Identification for an amateur is not straightforward but I think this is probably pompilus cinereus.) They find a spider, paralyse it with their sting, and drag it back to their burrow. Then they lay an egg inside the spider. Once the egg hatches, the larva eats the spider alive, from the inside out. Sometimes, if the spider is too big for the burrow, the wasp will pull its legs off. The expression, “feeling waspish”, takes on new significance! Some wasps have an elegance about them, like the slim-waisted society belle below. Hence the expression, “waspish figure”. I think this is probably a type of digger wasp. This one has a damaged wing, which is why it stuck around long enough for me to get a shot off. Do not be fooled, however, by its stylish gown and slender grace. If my identification is correct, this beguiling debutante is parasitic too; the female lays its eggs in flies. Waspish in appearance and intent. 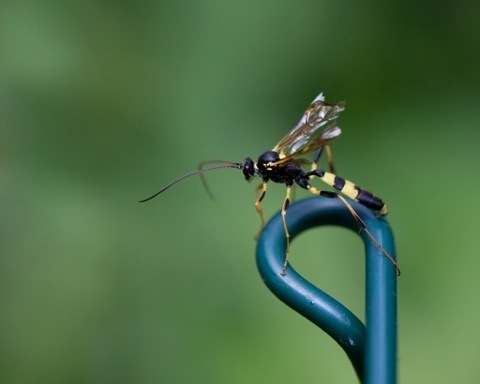 This entry was posted in garden, nature, photography and tagged common wasp, digger wasp, entomology, insects, macro, natural history, nature, photography, spider wasp, wasps by Rachael. Bookmark the permalink. Oh man, did you take these yourself? I would have been freaked out! So way to go on being braver than I! Well it depends on what you’re more afraid of. I think wasps would be more deadly, but spiders are just plain creepy. Omg, how did you take these shots? tell me you have a super big zoom lens and so you were thousands of yards away. How did you make insects that make me run screaming look so pretty? He he. No, two were taken with a 100mm lens on a full frame camera and the spider wasp was photographed using a 50mm lens on a cropped sensor, so 80mm equivalent. Thanks, Karen. That was taken during my 365 in 2009. I have to be honest, wasps give me the creeps. These are great photos though. Thanks. It seems that a lot of people feel the same! Beautiful shots again, I’m really envious! This reminded me of a campsite I shared with two friends in 2010 while hiking the PCT. I think it was in Oregon. Standing round a campfire in the late afternoon, I noticed some movement on the ground. We ended up spending half an hour watching a wasp drag a spider to its burrow – a long distance. When it got it there, it couldn’t fit it in, so it spent ages patiently excavating the entrance, removing a boulder-sized pebble, etc. It was captivating entertainment in the absence of electronic diversion! Thank you! It’s amazing what will serve as entertainment when camping. Did it chew the legs off the spider? I must say that was the creepiest thing about watching the one in my picture. It made me think of a line from Terminator: “The Terminator is just being systematic”. Thank you. That’s my favourite too. It has done well for me in a couple of competitions. As is reflected in a few of these comments, some people get creeped out by wasps, spiders, ants, flies, or other little creatures. I focus (there’s that pun again) mostly on plants that are native to my area, which is central Texas, but it’s impossible to look at plants for any length of time and not see some of their many small visitors, which then become subjects in their own right. I can see you’ve had fun with and made good use of your macro lens. I also see you have a fondness for hover flies, which I’ve recently come to realize are much more numerous here than I’d noticed. Thank you very much, Steve. I started my macro life with flowers too and then came to appreciate the bugs. I can handle bees, but can’t stand wasps! They just seem malicious! Though they do make for some stunning photos. I adore the amount of detail you’ve captured on these guys here.